The Appalachian Mountains are only now beginning to be recognized as one of the primary incubators of African-American music, especially the blues tradition. Appalachian blues comes in a variety of styles—vaudeville blues, piano blues and boogie, string-band dance blues, guitar and harmonica-based down-home blues, ragtime blues, East Coast rhythm and blues, and so-called white mountain blues. Moreover, it includes such celebrated artists as Bessie Smith, Cripple Clarence Lofton, Cow Cow Davenport, Pinetop Smith, Josh White, Rev. Gary Davis, Jaybird Coleman, Luke Jordan, Dinah Washington, and James Brown. Why, with such an array of blues legends—the Empress of the blues, the Queen of the blues, and the Godfather of soul—has the region's blues tradition received so little attention? Part of the answer lies in the sheer size of the region. The Appalachian Mountain chain cuts diagonally across the Eastern United States from New York to Mississippi, with Appalachian counties in a full thirteen states. Another factor has to do with demographics. Common wisdom held that there wasn't a sufficient black population in the mountains to sustain a viable blues tradition, in contrast with the cotton belt of the Deep South. One result of this bias was to associate the region almost exclusively with the country-music industry, which historically excluded black musical participation. A closer look at the region and its history reveals a more complicated story. First, in regard to demographics, the black population varied significantly from Alabama to West Virginia, and while whites may have outnumbered blacks across the region as a whole, the ratio was by no means uniform. Moreover, urban centers attracted substantial black populations, and blues thrived in Birmingham, Alabama, Spartanburg and Greenville, South Carolina, and Chattanooga, Knoxville and Kingsport, Tennessee. Finally, after the Civil War and during the expansion of roads and rail into the mountains, Southern blacks came in as workers, helping to open up Appalachia to broader cultural influences. Others were attracted by work in the coal mines of Kentucky and West Virginia. Among the workers were musicians, including professional musicians, who brought new techniques and served as musical role models. And whether they remained in the region or moved on, they left their musical signature. Unfortunately, few of those artists had a chance to record, and they remain undocumented except in the memory of musicians who happened to have been interviewed. They recall a thriving blues tradition even though the discographical evidence appears to indicate the opposite. But the extent of recording is more a question of whether or not record companies wanted to expend the energy to seek out musicians in such relatively inaccessible environs and of what they chose to record once they got there. A major exception to this was Victor's 1927 Bristol Sessions, commonly called the "Big Bang of country music." Two major stars, Mississippian Jimmie Rodgers and the Appalachian Virginian Carter Family, were found at this session. Although they recorded a lot of blues and other forms of black music, both were white, further reinforcing the tendency to put a white face on the genre "mountain blues." But the sessions also produced recordings by several black artists: several sides by harmonica player El Watson and the Johnson Brothers, two of which were entitled blues, "Pot Licker Blues" and "Narrow Gauge Blues." On November 2, 1928, Victor recorded two more blues sides by the duo Stephan Tarter and Harry Gay, "Brownie Blues" and "Unknown Blues." A Columbia-Okeh field trip to Johnson City, Tennessee, on October 24, 1929, produced two blues by Ellis Williams, who played harmonica on "Buttermilk Blues" and "Smokey Blues." Brunswick-Vocalion conducted several sessions in Knoxville, Tennessee, on August 28, 1929, recording two unissued blues by Odessa Canselor, two sides by songster Will Bennett, "Real Estate Blues" and the blues ballad "Railroad Bill," and two songs by Leola Manning and Eugene Ballinger, "He Cares for Me" and "He Fans It." During an April 1930 Knoxville session, Howard Armstrong's Tennessee Chocolate Drops, composed of Armstrong, Carl Martin, and Roland Martin, recorded two sides, "Knox County Stomp" and "Vine Street Drag" for Vocalion. Leola Manning recorded four sides, "Arcade Building Moan," "Satan Is Busy in Knoxville," "Laying in the Graveyard," and "The Blues Is All Wrong." Gennett recorded blues in Birmingham, Alabama, during the summer of 1927, recording Jay Bird Coleman, Daddy Stovepipe, Whistling Pete, William Harris, Joe Evans, Arthur McClain, Bertha Ross, Ollis Martin, and Wiley Barner. Brunswick also visited Birmingham in 1928 but recorded no blues. Returning again almost ten years later in 1937 as ARC, they recorded various blues artists, including Peanut the Kidnapper, Charlie Campbell, Guitar Slim, and the duo Mack Rhinehart and Brownie Stubblefield. Through the 1940s and 1950s black musicians from Appalachia followed the general African-American population in the Great Migration to the urban North. Although some recording occurred in Philadelphia and New Jersey, New York City served as the major musical magnet, much the same way Chicago drew musicians from the Delta and the Deep South. Recording opportunities in New York City included both small rhythm-and-blues labels looking for commercial hits and the Asch, Disc, and Folkways labels with a broader interest in documenting traditional music. This latter position enhanced Folkways importance during the folk revival, making it the principal label documenting Appalachian traditions and Southeastern blues. 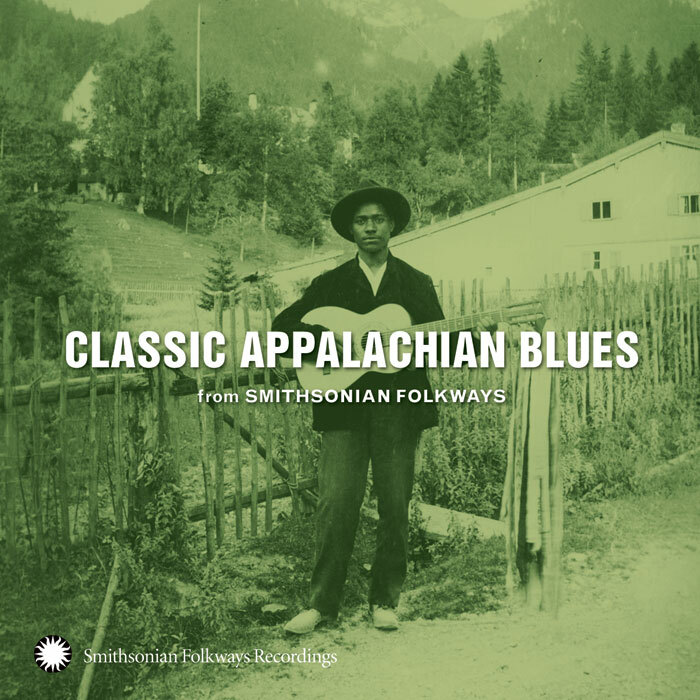 This CD draws on these Asch and Folkways recordings dating back to the 1940s and on live recordings of Appalachian musicians made at the Smithsonian Festival of American Folklife in the 1970s and 1980s. It features musicians from seven states: Chief Ellis from Alabama; Baby Tate of Georgia; Pink Anderson, Ted Bogan, Gary Davis, Peg Leg Sam Jackson, and Josh White all from South Carolina; Etta Baker, J.C. Burris, and Doc Watson from North Carolina; Roscoe Holcomb and Bill Williams of Kentucky; Howard Armstrong, Brownie McGhee, Stick McGhee, and Leslie Riddle from Tennessee; and Estil C. Ball, Archie Edwards, Marvin and Turner Foddrell, John Jackson, Carl Martin, and John Tinsley from Virginia. Several sidemen—John Cephas, Phil Wiggins, James Bellamy, and Tommy Armstrong—come from outside the Appalachian region. The entire group of musicians includes three harmonica players, two bass players, a piano player, a fiddler, and one mandolinist; the rest play guitar, the signature blues instrument of the region. The guitar came to the Appalachians relatively late via mail-order catalogs and the U.S. Mail, but it quickly became the poor man's piano and a source of pride for the accomplished player. The harmonica was also inexpensive and expressive as an accompaniment for the guitar, and a harmonica/guitar duet tradition became an important part of the Appalachian story. While there was diversity in the guitar styles within the region, based both in location and generation, there was also stylistic continuity: a fairly complex finger-picking style characterized much of the region. Usually it involved the thumb and two fingers, with the thumb laying down a solid bass line and the fingers picking melody on the treble strings. Appalachian guitar was also relatively smooth and rhythmically simple, making it more accessible to white players. Furthermore, there was a strong preference for ragtime progressions, up-tempo eightbar blues, and other upbeat music suitable for house parties or other country dancing. In general, the instrumental approach was lighter in texture and more melodic, and it employed more chord technique than the harsher, more intense Delta guitar styles. Moreover, the antiphonal, or call-and-response patterns typical of much black music were deemphasized: increased emphasis on faster tempos left less room for the response part of call and response. This tendency to speed up is found in other regions as well, but seems more pronounced in the mountains. Finally, while there is increased emphasis on instrumental dexterity, there is less emphasis on the nuanced phrasing and tonal expressiveness found in the Delta. Similar patterns hold for vocal styling, although once again it is important to recognize diversity within the region, with Gary Davis at one end of a spectrum and Archie Edwards or John Jackson at the other. Of course, Davis' insistent harshness may be a consequence of his long tenure as a street singer and of his religious repertoire. Nevertheless, black Appalachian vocal style is generally less intense, less emotional and preacherly, than styles from the Deep South. This may be a function of more frequent racial interaction, performing for mixed audiences or, as some scholars have suggested, less harsh living conditions coupled with closer ties between black and white communities. The persistence of a string-band tradition shared by both blacks and whites also affected blues development. In the first place, blues did not so clearly displace earlier forms of African-American dance music in the mountains as it did in other parts of the South. Instead, blues became one of several forms of popular party music performed at country dances, and the eventual transition from fiddle and banjo music to guitar and harmonica-based blues occurred more slowly in the mountains, where set dances and square dancing were part of black rural recreation well into the 1940s. Eventually, the string-band tradition fell out of favor in the African-American community, although artists like Martin, Bogan, and Armstrong and the Foddrell family maintained the tradition up to the 1980s for home consumption and on the festival circuit. But many of the same artists who once worked in string bands continued to perform in regional variations of guitar or guitar and harmonica-dominated down-home blues. Evidence suggests that the blues arrived in Appalachia well after it had become entrenched in the Delta. It was brought by itinerant musicians who sought work in the mines or building roads and railroads, and who entertained themselves and other workers in their leisure time. We also see professional musicians working the region, hitting the paydays at various work sites. These would include walking musicians, medicine show performers, and artists associated with minstrel or carnival shows. Most often, however, they were individual guitarists who stopped off to play the streets or a social gathering then moved on. At times musician's paths would cross, and songs and ideas might be exchanged in an impromptu jam session, and then each musician would move on to their next destination. So I cut out and went to Asheville, North Carolina, and met a guy there that played guitar. And we got together, and he said, "Let's go to Knoxville, Tennessee." I said, "I don't care." So we left and went to Knoxville. But he was married, and he got a message his wife was ill, and he had to go back. McGhee, Jackson, and Edwards grew up listening to blues and old-time country and learning from both. This, in part, accounts for the racially mixed repertoire and style of Appalachian blues performers. But, as Edwards, Jackson, and McGhee also noted, black listeners found the so-called country music very familiar. It was, as McGhee said, "black stuff in the first place." However, whites' listening to and learning from blacks, and vice versa, predated the arrival of phonograph records through much of Appalachia. A white blues tradition is by no means unique to the Appalachian region, but Appalachian blues has an interracial, or perhaps non-racial, quality. Whether one sees this as blacks playing in a white style or as whites adapting African-American style, the fact remains that there is an overlap, just as there was in the earlier string band tradition. Blacks and whites learned from the same phonograph records. They participated in integrated musical events. They drew from a shared string-band tradition. And black professionals performed before mixed or white audiences. All of these conditions laid the groundwork for a more homogeneous, integrated black and white tradition. This is not to say that Appalachian blues is corrupted by white folksong values or that it is less "African" than other blues styles. It simply means that among the diverse forms of Appalachian blues we find a variety of blends—the result of merging African and European musical values in ways that made sense to local musicians.